The Japanese space agency JAXA has confirmed that its space probe Hayabusa 2 has reached the asteroid Ryugu. It’s now at an altitude of about 20 kilometers and from there it will begin a series of observations of the surface in order to find the most suitable area to land. That maneuver will take place in October 2018 at a date yet to be determined. Launched on December 3, 2014, this mission follows the one of the space probe Hayabusa, which had a number of problems but eventually managed to bring back to Earth some samples of the asteroid 25143 Itokawa. With the experience accumulated over the years, engineers and scientists from JAXA and the German (DLR) and French (CNES) space agencies that are collaborating on the new mission hope to have fewer problems in studying the asteroid Ryugu, originally known as (162173) 1999 JU3. 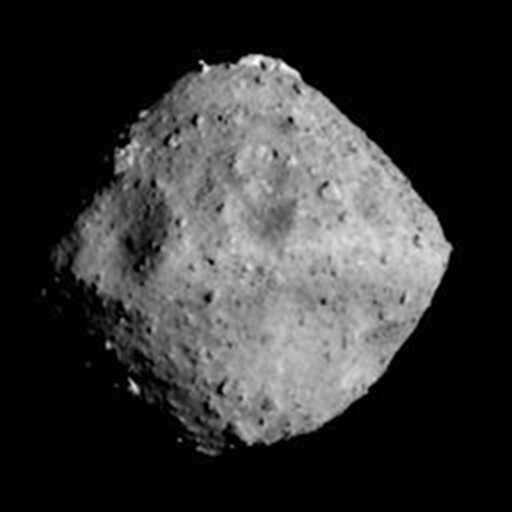 In recent days, JAXA published a number of photos of the asteroid Ryugu taken by the Hayabusa 2’s ONC-T (Optical Navigation Camera – Telescopic) instrument up to the one taken on June 24 from a distance of about 40 kilometers (courtesy JAXA, University of Tokyo, Kochi University, Rikkyo University, Nagoya University, Chiba Institute of Technology, Meiji University, Aizu University, AIST. All rights reserved). The asteroid Ryugu is part of the category called NEO (near-Earth object), whose orbit brings it close to the Earth and in some cases even through the Earth’s orbit with the consequence that it’s also included in the category of the potentially dangerous asteroids (PHAs). It also belongs to the Apollo class, a group of NEO-type asteroids whose semi-major axis is greater than Earth’s and a perihelion lower than the Earth aphelion. As for its composition, Ryugu is a carbonaceous asteroid, or type-C asteroid, which means that it contains a high amount of carbon, like about three-quarters of the asteroids in the solar system. Its composition is the most interesting part from the scientific point of view because it’s expected to be similar to that of the early solar system. In fact, its study could offer further information on the solar system’s birth and evolution. The chemical analyzes of the asteroid Ryugu will be carried out by the three rovers that will land in the MINERVA-II container and the MASCOT (Mobile Asteroid Surface Scout) lander. Among other things, they will allow to understand whether the surface is dark due to the high presence of carbon or there are also metallic particles. JAXA and its partner agencies hope this is just the beginning of a long part of the mission full of discoveries. Each operation will be carefully assessed and programmed based on the collected data. For example, Ryugu’s gravity assessments will be carried out: it’s very low because it’s a vaguely spherical asteroid with a diameter of around 900 meters but must be taken into account.